We were working on some maintenance accounts this week. This garden, up in the Berkeley Hills, is one I love. We do monthly maintenance here and have done some renovation over the past year, replanting some areas that needed it and replacing a few plants here and there. It is a shade garden in the front, and the plantings here have to be tough to withstand the neighborhood deer and the needle drop from a huge pine overhead. 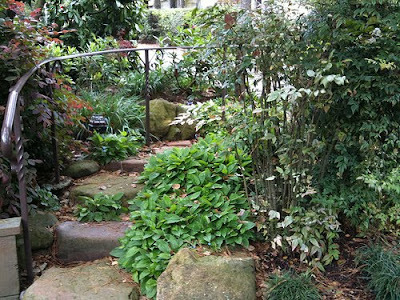 The focal point plants are rhododendrons and maples, with an understory of complimentary ferns, hellebores, and some other woodland perennials. The planting also has an Asian feel, with plants like pieris, nandina, and bamboo. 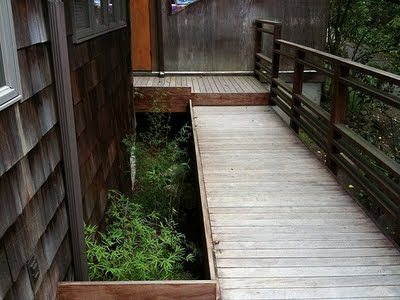 The homeowner is an architect and I love the elegant deck she designed for the walkway along the side of the house--it floats. Keep blogging! I very much enjoy reading your posts. your no.1 fan from up in the Berkeley Hills.